Each month we do a poll about a relevant topic. If you are reading this on the website, you can see it to the right of this post. The most recent poll asked the question, "What is your biggest volunteer challenge?" There are 5 answers to choose from. You can see from the votes how they ranked. Let's take a look at these challenges and talk about some ways you can overcome them. #1 - Showing up late. I was reading a recent post on Facebook, where a leader was asking for advice about what to do regarding an awesome volunteer who is habitually late. Once the volunteer finally gets there, she is amazing. She just can't seem to get there on time. We all know what that's like. You are waiting on a volunteer to open a classroom, praying they will get there any minute. Not a fun spot to be in, is it? Set clear expectations up front. When you bring someone on your team, emphasize the importance of being on time and being prepared. High expectations lead to high performance. Elevate the importance of the mission. Constantly remind volunteers how critical what they do is. This is life and death. The mission deserves our very best. This has to be ongoing. Remember, vision leaks. You have to continually refill it. Have a huddle that you ask people to be at before they start serving. The huddle should include laughter, a short time of teaching, prayer and more. You can read about this here. Have a monthly drawing for a gift card for people who are on time. Each time you arrive on time, you get to enter your name into the drawing. Have a courageous conversation when needed. If a volunteer continues to be habitually late, it's time to sit down with him or her. This conversation should be founded not in condemnation, but in challenge. It must also be grounded by relationship. When someone knows you care about them...not just about what they do, it opens their heart to receive your instruction. Find out why they are late. They may be going through some extenuating circumstances. Ask how you can help them. #2 - Lack of preparation. It is frustrating to watch a teacher stumble through a lesson unprepared, isn't it? It is frustrating to see a small group leader trying to figure out the next activity while the kids create their own activity, isn't it? It is frustrating to have a preschool leader asking how to do a craft that you sent him or her clear instructions about, isn't it? Make sure you're getting the materials, lesson, etc. to your team well in advance. The more time you give them to prepare, the easier it is to hold them accountable. Create a feedback culture. When a volunteer knows you want to see them grow and improve as a leader, they will be receptive to feedback. In fact, if they know you truly have their best interests in mind, they will ask you for it. This gives you an opportunity to coach them about preparedness. Here's more insight on giving feedback. Provide them with preparation tools. The person may simply lack the understanding of how to prepare properly. Give them tools that will help them in their preparation. #3 - Retention. It is normal to have some volunteer turnover. Life happens. People get sick. People move. People's work schedules change. These things are unavoidable. But outside of these reasons, a healthy children's ministry will retain a high percentage of their volunteers. If you're having a lot of turnover, there are some things you can do to overcome this. Make sure people are serving in their sweet spot. When people are placed in a role that lines up with their gifts and passion, they will go the distance. Create a culture of family. I believe the biggest reason volunteers stop serving is because they don't develop any relationships with the people they serve with. Relationships is the super glue that keeps people serving. Read this article for help. Help volunteers serve from the overflow. Just like you stop and get gas for your car so it doesn't quit running, you must make sure your volunteers are getting their spiritual tanks filled. Make sure they are attending worship each week. Make sure they have some weeks off. Don't ask them to stay over and serve extra services. #4 - Consistency. Trends show that people are still attending church, but less frequently. And if you are not intentional, this can bleed over into their serving as well. Establish which roles require people to serve every week. There are some roles you may want to ask people to serve every week in. There may be others that do not require this. Honor faithfulness over talent. What you emphasize and honor becomes important. Promote those who are faithful. God's Word is very clear that faithfulness leads to more influence. Be consistent with a little and you will be given more. #5 - Vision buy-in. God has given you a big vision for the ministry. You want to reach more kids, make some crucial changes, try a new curriculum, remodel some areas, drop some outdated programs, introduce some new ones and more. But how do you get Sister so and so, who has been volunteering in the ministry before you were born, to buy in? How do you get people who are eyeing you suspiciously to get on board? Make sure the vision lines up your Pastor and leadership's vision. Your first priority is to take their vision and translate it into children's ministry. That's the starting point. If you're in a situation where this doesn't line up, you're in the wrong place. A vision that is not grounded in unity will falter and rightly so. Start with a small circle and get the buy-in of key influencers. I have watched great leaders do this successfully when they were moving the church toward a big vision. They start with a small circle and move outward from there. You can read more about this in my book If Disney Ran Your Children's Ministry. Show them the benefits of the vision. People resist a vision because people don't like change. Change takes people out of their comfort zone and frightens them. They have security in the way they've always done things. You must show them the potential that lies in the new vision. Point them toward something so great and beneficial, that it compels them to take a risk. Include them in helping formulate the vision. People will buy into a vision that they had a part in formulating and creating. People simply want to be heard and contribute. Give them a voice in the vision. Your turn. The floor is yours. 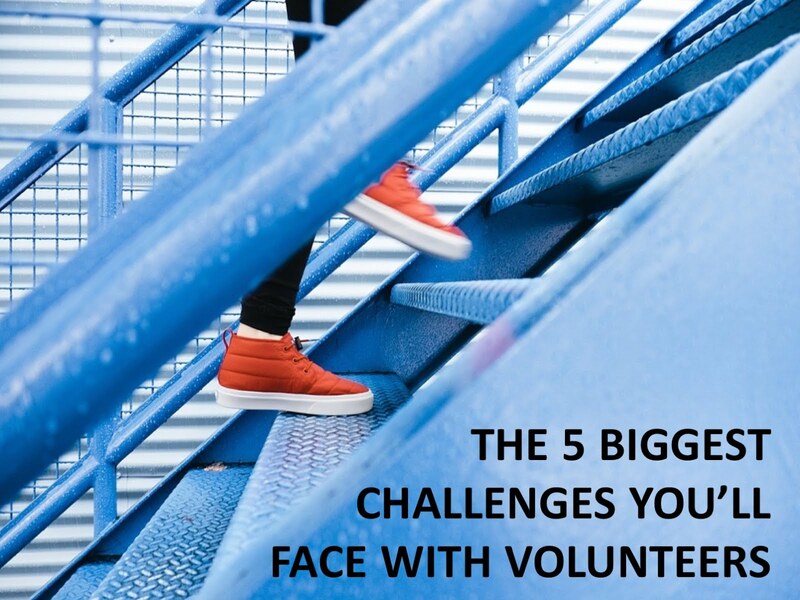 What are some other challenges you face with volunteers? What are some other tips for overcoming the challenges listed above? Share your thoughts with everyone in the comment section below.